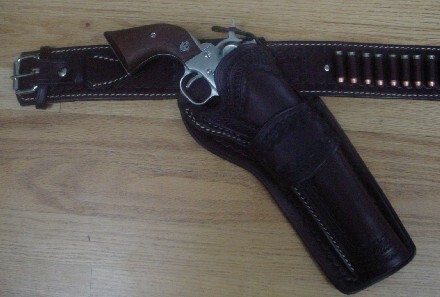 Review of a Laroche Leather Cowboy holster rig. I recently gave Cowboy Action Shooting a try at the Eastern Ontario Handgun Club. Going out once to show support for the new activity quickly turned into a shopping spree. 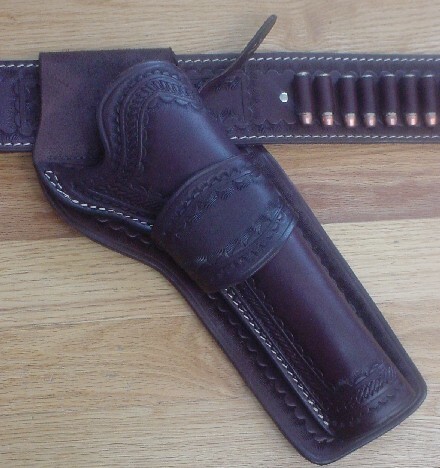 I already had a Ruger Blackhawk and a Ruger Old Army that were suitable for CAS style shooting, but I only had nylon holsters - a complete fashion faux pas if you want to hang out with authentic looking cowboys. Lots of the guys have holster rigs that cost around $500. A very competitive rig can hit $750 Canadian! While these rigs are of impeccable quality and are real works of art, I wanted something that would leave me with enough money to buy a lever action rifle. I paid a visit to Joe Laroche of Laroche Leather to see what he could do for me. Joe made my first IPSC rig back in 1988, in the days when IPSC holsters were still leather and not metal and plastic. I had a look at some of his work and photos of different rigs he has made in the past. I opted for a dark brown rig that he was able to make for me in several days. This complete rig was just $225 CDN ($165 US) plus another $50 for the decorative tooling! 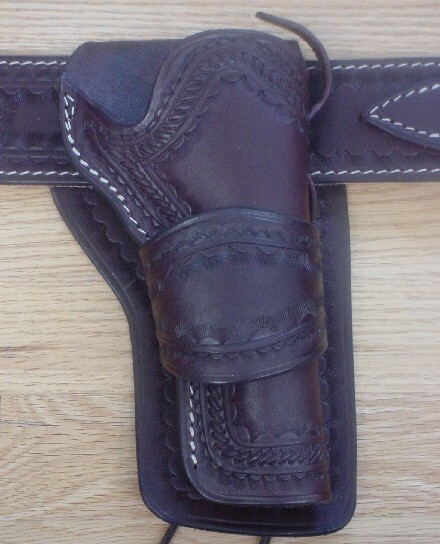 As I'm new to SASS style shooting and haven't tried lots of high end cowboy style holsters I cannot give an expert review of the finished product. However, I'm delighted with the rig. The quality of leather, stitching and design are quite good. The guns fit very well in the holsters. If I were doing it over again, I would have him change the angles of the holsters in relation to the belt by a couple of degrees. For anyone wanting to give CAS a try, but not wanting to break the bank, consider Laroche Leather.